TOKYO - Japan's space agency says its Hayabusa2 spacecraft will follow up last month's touchdown on a distant asteroid with another risky mission - to drop an explosive to make a crater and collect underground samples to get possible clues to the origin of the solar system. 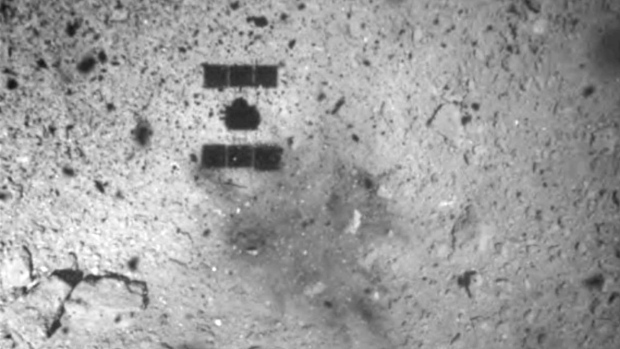 Hayabusa2 successfully touched down on the boulder-rich asteroid Feb. 22, when it also collected some surface fragments. The Japan Aerospace Exploration Agency said Monday that Hayabusa2 is to drop a copper impactor on the asteroid April 5 to collect samples from deeper underground. The mission requires an immediate evacuation of the spacecraft so it won't get hit by flying shards from the blast.